If a checked page cannot be checked or displayed correctly, then try the next check technology. Start with the "Default" method, if it fails then try the next method, always from top to bottom. With the check technology "Internet Explorer / Browser", WebSite-Watcher creates a hidden Internet Explorer window and checks the page in that window. 2. 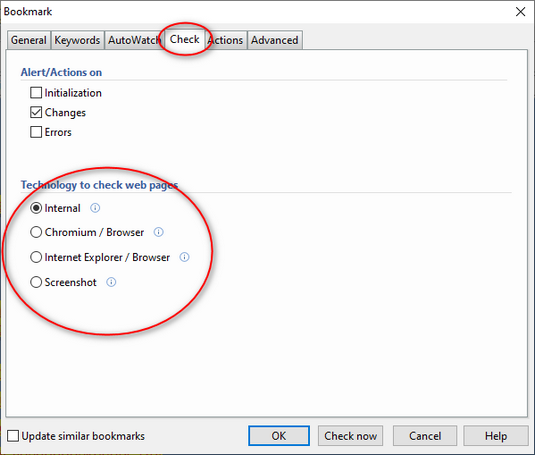 Select the tab "Check"
If the check technology "Internet Explorer / Browser" does not work, you can try the next method "Chromium / Browser". This works similar to "Internet Explorer / Browser", just with Chromium as browser engine. 3. Select the technology "Chromium / Browser"
As last step you can try the Check-by-Screenshot method. This method creates a screenshot of the loaded page and uses the screenshots to detect changes. 3. Select the technology "Screenshot"